How can I assign a dashboard to a particular user? What are "Dashboard permissions"? When you add a user to the Honestly account, you give them acces to particular surveys and automatically, they will be granted access to the dashboard of that survey. 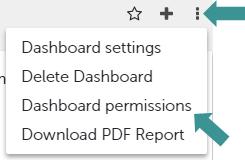 If however, an administrator would prefer it if some people, regardless of their rights, didn't have access to the dashboard, they can now specify this using "Dashboard permissions". Then click on "Dashboard permissions". In this example, Jane Williams is the only user who will be able to see and subscribe to this dashboard. Both Paul Jones and Mary Smith will only be able to view the questionnaires and surveys but not the associated dashboards. 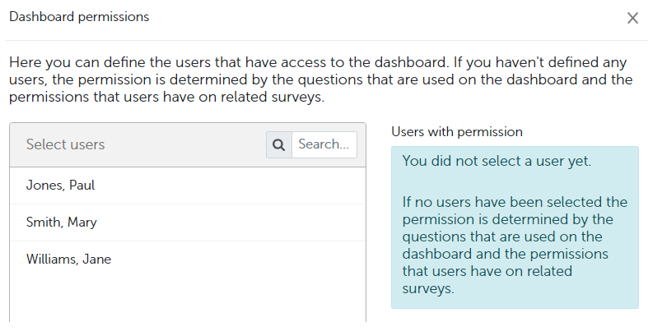 PLEASE NOTE: If you do not make any changes to the dashboard permissions, access granted to each user with regards to the surveys/questionnaires will apply here too and every user who has access to the questionnaire used will also have access to its dashboards. Remember to save all your changes! Dashboard permissions can only be added or changed by admins. ALL admins can always see ALL dashboards. It isn't possible to "hide" dashboards from an admin. What is a dashboard und how can I create a new one? How can I edit an existing dashboard?